To visualize how great the loss would be if the EU breaks apart – that is one of the concerns of the annual Europe Day, which was celebrated this year in Bad Reichenhall on the 28th of May 2018 with a ceremony in the concert rotunda. Therein,former Governor of Salzburg Prof. Franz Schausberger spoke. He campaigned for a citizen-oriented EU, in which individual countries should not isolate themselves. Nevertheless, Europe’s borders must be secured externally. Even if one can not approve of their policies on all points, one must be glad that Hungary and Austria have largely blocked the Balkan route for refugees. In order to avoid refugee flows from Africa in the future, one must start with a new policy in Africa. So far, development aid has often only supported the local potentates and brought little to the peoples. 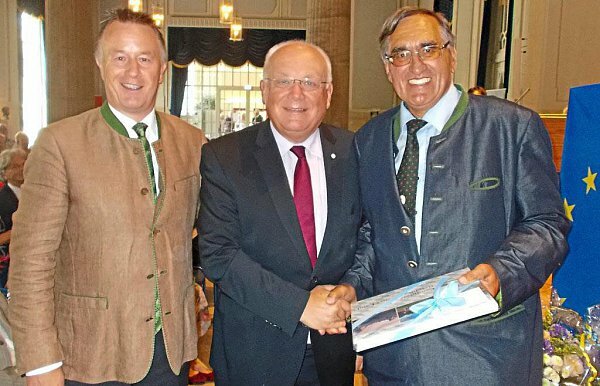 At the ceremony, the Europa-Union Berchtesgadener Land, the administrative district Berchtesgadener Land, the city of Bad Reichenhall and the Reichenhaller philharmonic orchestra had jointly invited. In his greeting, Dr. Lackner emphasized what great value Europe has for all citizens. Furthermore he referred that a life in peace and freedom is a great gift and by no means self-evident. The keynote speaker, Professor Franz Schausberger, took up this topic. The long-term cooperation of the countries in the European Union has brought a great boon, and citizens should participate in their further development at all levels. He recalled that the founding fathers, in establishing state-level coalitions in Europe, aimed at ending old hostilities, not least for economic reasons, between peoples.